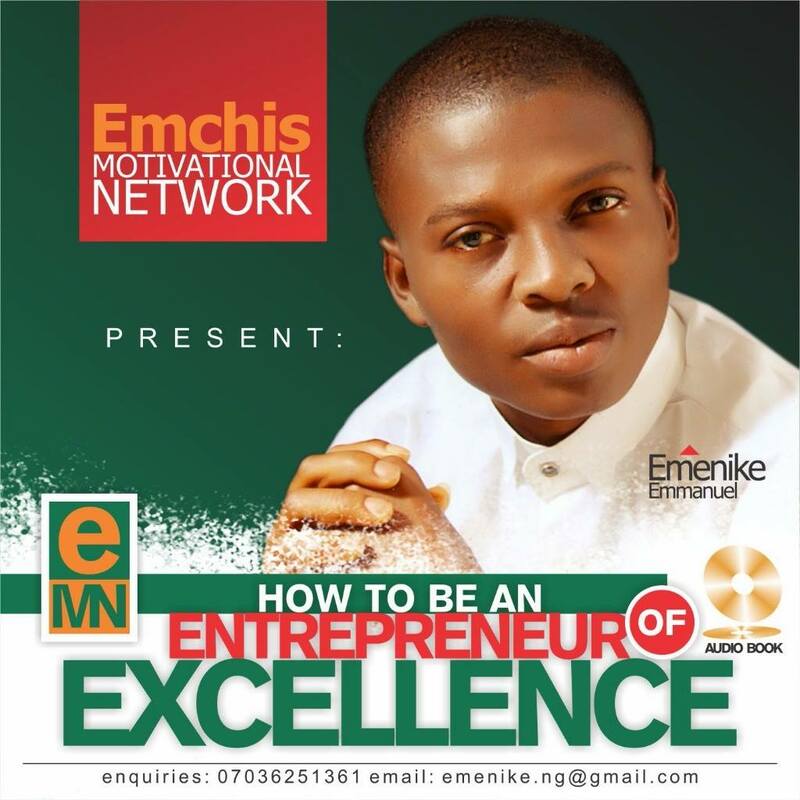 Emchis Consulting is the business development segment of Emchis Motivational Network. Emchis Consulting has a goal which is to help individuals and corporate bodies become leaders in their industries. We partner with government, Churches, Schools and organizations in educating youths on the need to become business owners and also tackle the menace of unemployment – giving more interest to home-based businesses and part-times that will not interfere with their academic pursuit. Over time, we have shown our expertise in hundreds of articles published online and in some Nigerian Magazines and also through speaking engagements. On invitation to speak to organizations we do our very best to ensure we left the employees or attendees motivated, inspired and ever-ready to perform at their very peak. The turnouts in sales after our presentations on Leadership, Selling and Customer Service Relation have always been wow… Through the leadership of the CEO, Emenike Emmanuel, several ebooks and Audio book have been published. Our blog, http://www.emchisconsulting.wordpress.com is one among the last hope of the common man when it comes to seeking for business and career advices. Some of the exclusive interviews conducted by Emenike Emmanuel which are published on our blog on personalities in Africa, America and Europe have been a source of encouragement to our teaming youths who pop-in online to gain inspiration from our blog. In Emchis Consulting, we offer you and/or your organization an opportunity to be advertised online, through our Motivational Business Series (audio books and Video Tapes), Emchis Financial Empowerment Summit (EFES) and magazine. Invite Emchis Consulting to your next Business or Leadership Summit and your audience will never regret for attending. Thank you for quoting me. For more tips on how to be a successful businessperson, read our book “Modular Career Design–How You Can Diversify Your Career Income for the New Economy.” -Jennifer Ritchie Payette and Chris Lutz. Find our book on Amazon and Kindle. You are welcome Jennifer. Good to have you on my blog. Thanks to you Syed for stopping by. Helping people stand out in business is my ultimate goal in this blog. But before I go ahead to assist you overcome business failure, what kind of business do you do? How long have you been in the business? Ok, I will consider doing that later. its so interestn so to speak. Yea, @Dunga. Our articles here are very interesting. Thanks for stopping by. May God guide and protect you for having a good dreams for youth and having the dream of remeding the unemployment in our nation. Keep it up. Thank you @Maxwell. God bless you for stopping by and for your kind prayers. By His grace we will reach the world with this message of transformation. this is an interesting blog. i like people that are innovative. Thank you @Benjamin. I love your spirit. Keep it up. Your blog will do wonders. Am a Architect, Photographer and Artist,… Yet I desire room for improvement, aw can I create the time…especially reading for personal development!